I've been doing GolfCentralDaily on Facebook and Twitter for almost 10 years and today has been THE busiest day ever. The reason? 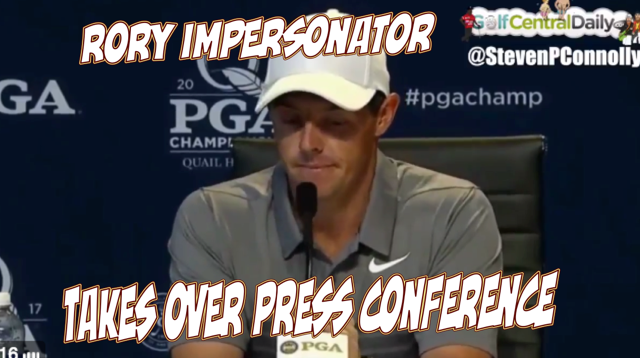 This video sent to me by golf impersonator Steven Connolly of Rory McIlroy explaining to the press what he is looking for in his next caddie. I've told Steven before that he's a comic genius and it's only a matter of time until he is discovered and I'm thinking now is that time. In the first 45 minutes of publishing on Twitter the video had over 45,000 views and is growing rapidly. Rory McIlroy tells press exact criteria he is looking for in his next caddie!! It's also gone viral on facebook. Please give it likes and shares and retweets. The great news is there are a tonne of brilliant funny golf impersonation videos out there on Steven's YouTube channel. Here's the link. Follow Steven also here on twitter! This is my favourite. Padraig Harrington gets a call from Sergio! !